Baan Dusit is a most unique development located only a short drive from Sukhumvit Highway in probably the nicest area in East Pattaya. Located on the Soi Wat Yan Road it is surrounded by the true culture of Thailand. This home offers fantastic value and comprises 3 good sized bedrooms, 2 modern bathrooms, good sized living area with open plan European kitchen, covered terrace and private swimming pool. The home comes with furniture and A/C throughout. 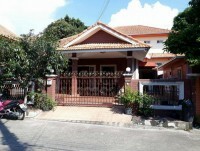 This home is held under company name and this will be given to the purchaser so no need for taxes or transfer fees. Living area : 138 sqm.